People used to snicker at farming simulators, posting ironic videos set to banging tunes on YouTube. Except... well... it turns out a lot of people really like them. 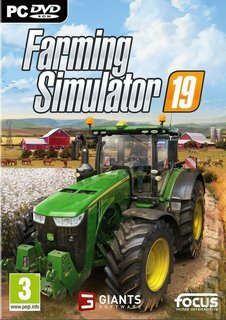 In fact, there are more different farming simulators released in an average year than football games nowadays. So take that, agriculture haters! Farming Simulator 19 is the latest offering from one of the big players in the genre, Giants Software (we'll just skip over the fact that they chose to skip over 18). Like previous games in the series, it has you sow, tend and harvest crops, rear animals and oversee your modest plot on its way to becoming a titan of agriculture against the backdrop of an open world in Europe or America. Giants are promising the biggest step forward yet, and the biggest move for fans of the series is the signing up of the largest agriculture machinery company in the world, John Deere, seeing them join the likes of Case IH, New Holland, Challenger, Fendt, Massey Ferguson, Valtra, Krone, Deutz-Fahr and many more. There are new activities in the mix, including the addition of oats and cottons to set your sights on. Probably the biggest change on this front, however, is the inclusion of horses for you to tend and ride around your open world kingdom.